How women prisoners escape from Planet Venus and travel through a vortex back to Earth. 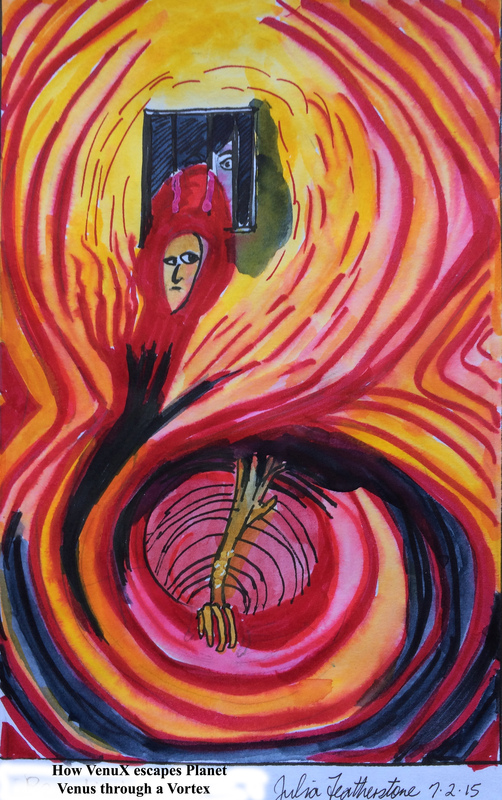 Sketch inspired by Brett Whitely’s oil painting, Bacon in Gaol. Inspired by the changing lights from late-afternoon into the night on the Fitzroy River in the Kimberley, 27th April, 2011. 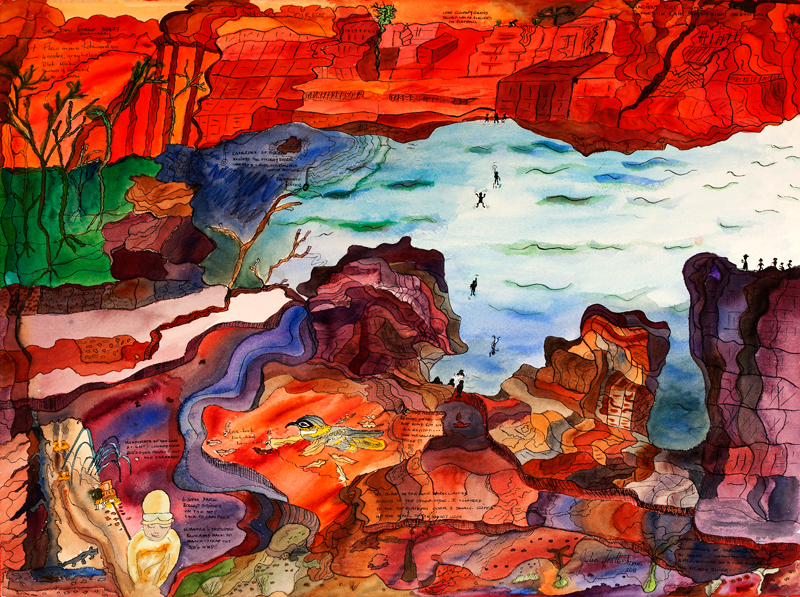 Based on location sketch below, then re-interpreted in Palm Studios Art Lab, Sydney. Framed in red, the painting is a gift for Lea Ferris, who inspired her friends to travel to the Kimberley for her 60th birthday!! Materials: W&N watercolours, Talens ink, Arches 300 gms watercolour deckle-edged paper. Julia Featherstone, Sunset Soiree Sir John Gorge 2011. Waterolour, pen on paper. Original drawing in my Kimberley sketchbook which was the basis of Kimberlea in the Wild. My gorgeous hand-made book with coptic binding, was made by friend-teacher, Wendy Shortland. Materials: Canaletto Smooth watercolour paper, Cotman watercolours, Copic pigment ink pens. 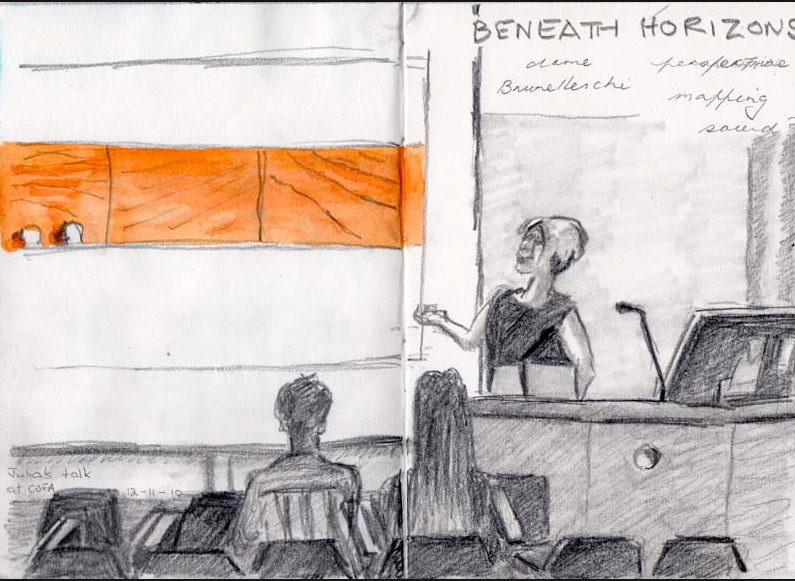 Wendy Shortland sketched me while I presented Beneath Horizons – my Master of Fine Arts, COFA research topic on 10th November 2010. I love Wendy’s use of selective orange to highlight the orange sand of my Desert Triad Series set against against grey graphite of me, audience and EG02 lecture theatre .